I love travelling and I especially love travelling with a film camera but sometimes getting onto an aeroplane is not always an option so instead I travel within my own city and look around me. I am lucky enough to live very close to central London, one of the most beautiful cities in the world where there is a photo opportunity on every corner. When I go out on a photowalk in London I put my 50mm F1.8 lens on my Canon 500 and make sure my film is around 400 ISO. I try to look at my world through the eyes of a visitor, I look for multiculturalism but also for signs we are still in London. This is Chinatown but the Union Jack flags and architecture show it is in London. 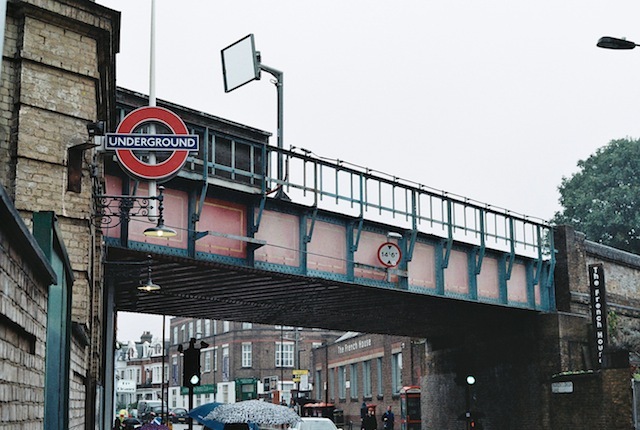 I also look for icons when I am out and about, everyone knows the sign for the London Underground. Everyone also knows it is London with the grey sky and umbrellas! Whilst looking through the Film Friday flickr pool I noticed others who were photographing their neighbourhoods. 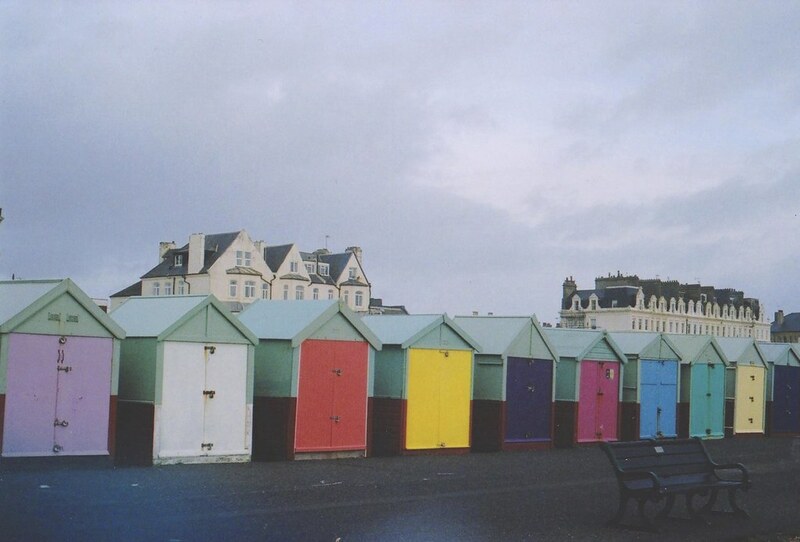 I love this wonderful shot of beach huts on Brighton Beach by Emily*W, again so iconic and a perfect glimpse into another world for a visitor. A perfect way to start our new theme Justine. I hope to visit London someday, it’s on my list! wondering around with a film camera, what a wonderful way to spend an afternoon. I’ve never done a photowalk with any of my film cameras. You inspire me, Justine! love seeing these snippets of your world in film! How pretty what is around you! 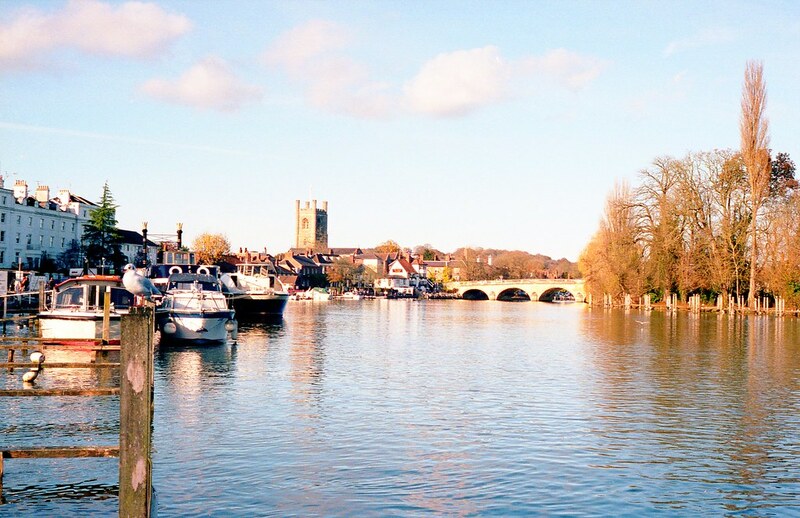 I especially love the colors on on those little buildings and so lovely you do it with film. I love the intent and great thought that goes into film. Always special. 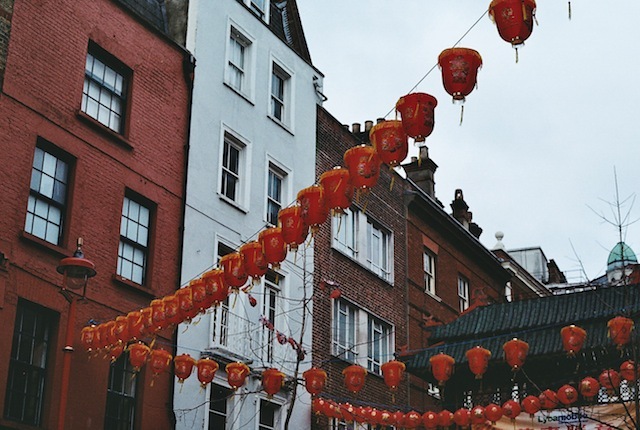 Always good to explore your own city, love your china town lanterns.. I’ll have to see if i can get my film camera fixed, I would really like to have a go. we look forward to seeing the results in the film flickr pool! I just took my film camera with me on vacation, but now I’m inspired to take my camera around my own town. Thank you! perfect segue Justine!! and I love that colored cottage photo. I am really looking forward to seeing the Flickr pool explode with new treasures from around the hood.